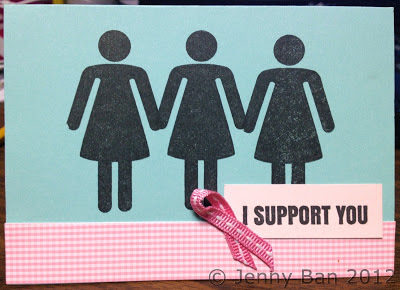 Jenny Ban Creates: Think Pink! I am back from a wonderful weekend at CKC-Chicago! I loved meeting so many creative people and demonstrating the A Muse Studio line of products. Welcome to any new readers I met at the show! I was so excited to see that my *FREE* "Fight Like a Girl" stamp set shipped early, and I inked it up right away. Here are a couple samples I hope will inspire you. 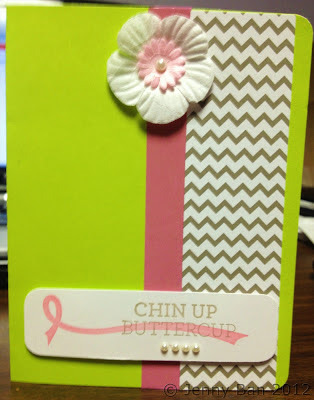 Remember, this stamp set costs only $3 for shipping/handling, and you can order it on my A Muse Studio website. The stamp sets are going fast, so get yours today! As an added bonus, you will get a coupon code off a future online order. Help us spread awareness about early detection and prevention of breast cancer.